The action-horror films set within James DeMonaco's Purge universe have endured the challenges of powering forward with an outlandish, yet compelling idea against the misgivings of its target audience. Numerous shortcomings led to the unsatisfying, seemingly oblivious execution of the concept with the first, Ethan Hawke-starring The Purge, in which the chaos of a lawless environment -- where illegal activity, including murder, is permitted for 12 hours -- gets confined between the walls of a house-invasion thriller. The aptly-titled Anarchy corrects that error, allowing the gunfire and terror to sprawl across an urban landscape while themes of class warfare and justified vengeance take hold. Election Yeara grows exaggerated and sloppy with its messages while setting its sights on political assassinations, but still knows how to generate unpredictable dread once those sirens kick into gear. Now, there's The First Purge, and despite this being a prequel, it acts as an escalation of what prior entries have set out to accomplish, blowing up the franchise's political intentions and submitting dubious cautionary explanations to how America devolved into its purge state. In the midst of economic and social turmoil, a new political party ascended to power in the good ole' US of A: the New Founding Fathers of America, or NFFA, a far-right extremist group hinged on totalitarian, police-state authority and abundant religious undertones. The First Purge doesn't really tell the story of their ascent, though, scanning over it to get to the point where the regime has decided to implement an "experiment": to make the boundaries of Staten Island in New York devoid of laws and repercussions -- even if it involves killing another person -- for a period of 12 hours, so that people can release their aggressive tendencies without repercussions. Since this hasn't been established as law yet, and since it only covers an isolated area where people could simply escape from, the NFFA has offered monetary incentives to both those electing to stay and those who wish to participate in the purging itself. Like the other entries, The First Purge follows separate groups of people as they navigate the inaugural "purge" and its moral quandries. Based on how the previous films worked, it seems as if James DeMonaco understood that any details he provided about how the NFFA ascended to power would be less convincing than the ones in the heads of his audience, so to this point he's mostly left those bits of world-building to the imagination. 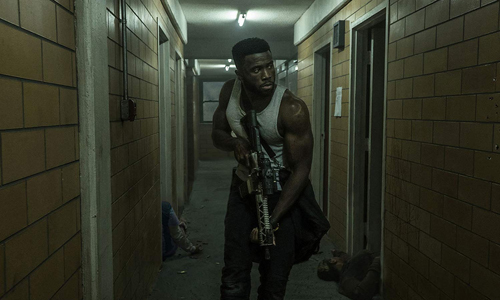 The First Purge only delves into that halfway, dedicating its energy toward how the regime executed this chosen solution for the first time and avoiding much explanation of the bureaucratic, legal, and humanitarian issues involved with getting this started up … on Staten Island, no less. DeMonaco gets too close to "reality" for comfort, though, as the progression of events leading to this first experiment gets one's mental gears turning to figure out how this semi-realistic state of America -- one coping with record poverty and unemployment -- could logically transition into this breed of elevated-reality, villainous despotism. By evading certain elements and revealing specifics about others, this prequel's coverage of "historical" events in DeMonaco's universe becomes expectedly wishy-washy and unthorough. The politics involved with The First Purge are an unpleasant battlezone, immediately and bluntly tapping into the prior films' concentration on class structure, poverty, and the anger that stems from those. DeMonaco and Fruitvale Station director Gerard McMurray go for the throat with the film's themes, to such a degree that it makes even Election Year seem (comparatively) restrained in what it sets out to do. Racial overtones twist together with reflections on modern-day concerns about how escalated violence and prejudice have become tolerated, but there's little nuance in how those points are handled -- or in who they're targeting -- and a discernible agenda drives everything forward while haphazardly coupling with the film's admissions about how people were paid to engage in the experiment. The commentary comes in broad strokes, and it forms into a daring, well-intended, yet divisive and lopsided takedown of what real-world forces could set "the purge" in motion. The First Purge still arrives at that feeling of anticipation once the red warning screen pops up on televisions and that deep, billowing siren starts to go off, triggering the end of civility and the beginning of unpredictable mayhem. There's an added layer of expectation in this prequel, though, involving the uncertainty of how quickly the lawlessness will escalate and how profound the bloodshed will be in this trial run. That should add a more human angle to how the dangers progress throughout the purge, yet the interventions of the NFFA -- including countless surveillance drones with guns mounted on ‘em -- and a drug lord's mindless threat management on that night produces forced shock-value theatrics, which undercut the relative authenticity of everything that's going on. Naturally, what happens on the streets of Staten Island isn't as gory or shocking as the carnage in the previous films where the annual purge has become a custom, but pointy-hooded mobs cruising in trucks and a scarred-up drug addict sporting claws made of syringes do capture a similar amount of bedlam. 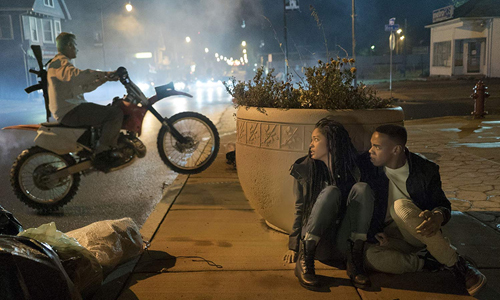 A lot of confidence gets placed in the power of the messages being communicated in The First Purge, in hopes that the significance of what's being expressed will convey enough about the ugliness of authority figures -- and racial division -- to create its own unique brand of terror that'll carry it until the credits roll. As a prequel to over a decade (maybe two?) of annual purges, however, these overtures of heroism and resistance are diminished when considering what's to come in the dystopian future that DeMonaco's previous installments have already brought to the screen, which doesn't do any favors to the transformation of a well-known, murderous drug dealer into an almost John McClane-esque savior. Y'Lan Noel is a badass as the dealer, Dmitri, and his soldierly poise as he grabs assault weapons and enters towers to defend the innocent gets one's juices flowing in a grindhouse-action sort of way, but he's fighting against more than an army of militarized purgers at this point: his heroic turn is also fighting against numerous lapses in logic that kept him in a position to become Staten Island's knight in shining armor. After the dust settles around him, this depiction of The First Purge has done more harm to the setting than it helped.